Sometimes God shows up in the most unexpected places, with the most unexpected people! The homeless man, or woman, or child in the street has a name. Roxanne lives in the streets of Hollywood; she sleeps under signs that advertise the next great movie coming out. She sometimes sleeps in the parking lot of a beautiful cathedral church. We found her in a dirty alley. We almost didn’t notice her as she was buried under piles of trash . I’m guessing she was not able to walk well, or stand very long, or maybe not at all anymore. Whenever we have seen her, she is lying flat out on the sidewalk. You can’t meet someone like Roxanne without being changed. She had a little section of the alley lined with her own trash – broken objects, bags of garbage, cups, plastic forks – that kind of stuff. She was lying on a filthy blanket that she had laid out to look like a bed. On the top of her organized trash, was a vase with plastic flowers in it. It still makes me cry – she was trying to create a home for herself! I was so honored to talk to her – we talked about God, how He knew exactly where she was. 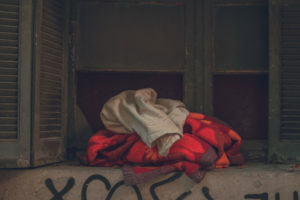 As I was telling her that He cared about her, and wondering what those words might mean to someone down in the drudges of the filth of life, I remembered I had brought her a blanket. I am telling you THIS because we all need to understand that God DOES care! I ran to the car to get it. 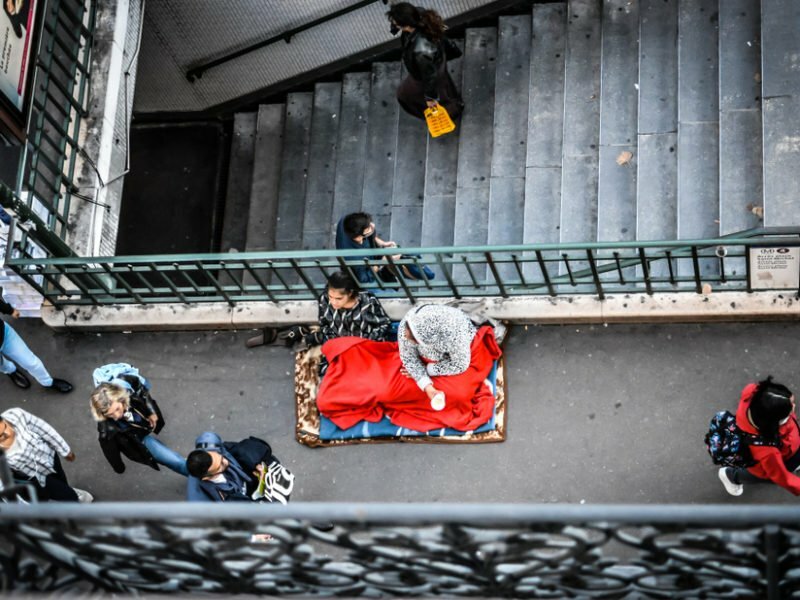 I took it over to her and told her the crazy truth, “God told me to give this to you.” She gave a little gasp, and said, “Oh, I saw THIS blanket in a movie once,” she told me all about the story, “the lady had this blanket/shawl and I REALLY wanted one. It was red and black.” This might not seem like a big deal to you – but, I can assure you, it was a really big deal to her. And to me. She held my hand, still lying on the ground, still surrounded by garbage. But she had a warm dinner we had brought her, a warm blanket only God knew she wanted, and the love of God shining on her dirty face. To me, she was the most beautiful person I had ever met; an angel unaware. It truly became a sacred “Heaven meets Earth” moment. Roxanne. My new sister in Christ. In a back alley somewhere in Hollywood.